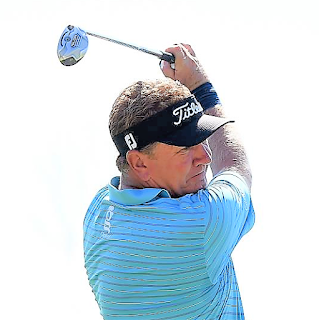 Paul Broadhurst, winner of the 2016 Senior Open, will go in search of his second Senior Major championship as he heads into the final round of the KitchenAid US Senior PGA Championship just two strokes off the lead. Starting his day with five birdies on his first six holes, and then adding another at the par four eighth hole, the 52-year-old Englishman recovered from a bogey on the 12th hole with two further gains to finish seven under par on the day. Broadhurst sits in third place behind joint-leaders Tim Petrovic and Scott McCarron, who won his first Senior Major championship at the Constellation Senior Players in 2017. The American pair are both 13 under par after 54 holes. Colin Montgomerie, a two-time winner of the Senior PGA Championship, is joined by fellow staysure Tour members Jesper Parnevik and Chris Williams in ninth place on seven under par. 2002 Ryder Cup player Phillip Price carded a four under par round of 67 to move to 18th place alongside 1993 Ryder Cup player Barry Lane on six under par. Paul Broadhurst: “Everything was going along nicely. But you're not going to keep that sort of momentum going for 18 holes and obviously the run slowed down a little bit in the middle. “Poor bogey on 12. Bounce-back birdies at 14 and 15. Finished pretty solid over the last three. So really pleased. “The more you're up there, the more you're in the last two or three matches the more comfortable you feel. Hopefully it will stand me in good stead. "What I can take from it? I guess that I came out victorious at Carnoustie. But there's some top players up there, obviously. Scott's been playing really recently, Miguel won last week. "So I'm going to have to come out and shoot 4-, 5-under again on Sunday. I'll give it my best shot and see what happens. “Normally you would say I'm happy chasing, but in Europe last year I led from start to finish in back-to-back tournaments that I played. Scott McCarron: “I certainly feel comfortable being in the hunt, being in the last groups. I've learned a lot over the last couple years playing with Bernhard Langer a lot. I've been fortunate enough to play with him in a lot of final groups and second to last groups and battled it out with him and watch him.